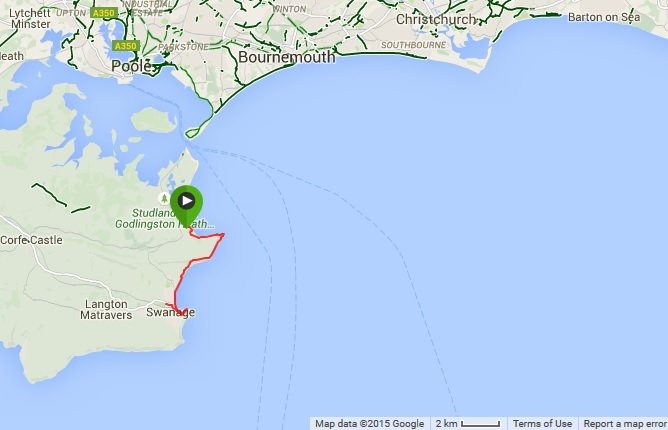 At Studland the coastal path turns east, ending after three quarters of a mile at Handfast Point and Old Harry Rocks. 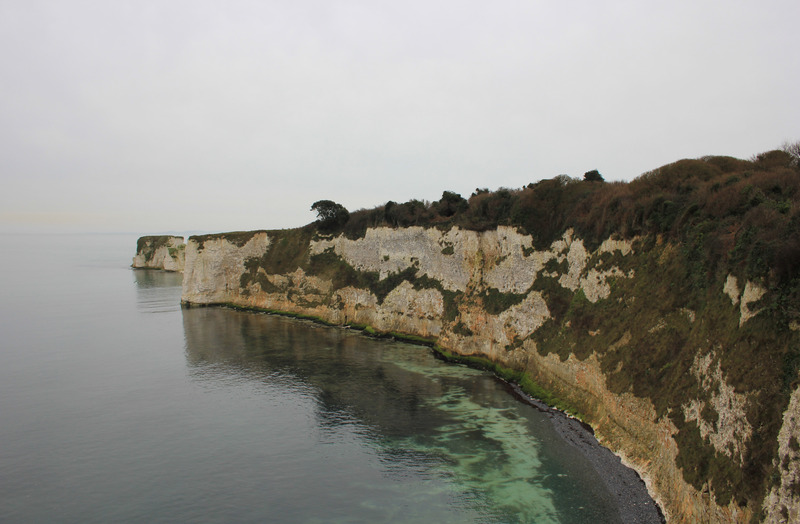 The landscape here is chalk cliffs with sheer drops to gravel banks and the sea below. At the headland to the far east the chalk splinters and breaks, with a few pieces remaining upright but separated from the mainland. These are Old Harry Rocks. H G Wells is here! His ashes scattered to the wind and the sea in 1946. About 125,000 years ago sea levels were higher than they are today. Yet 40,000 years ago, during the last Ice Age, they dropped by a massive 140 metres. This exposed a huge chalk ridge which stretched from here at Studland all the way over to the Isle of Wight, 15 miles away. Have a look on Google Earth – you can envisage this ridge very easily. Rivers had cut their way into the ridge, breaching it in several places. About 20,000 years ago the ice sheets began to melt; the melt water followed the natural course of these rivers. As more melt water poured in the area began to flood. The rivers widened the channels in the chalk, and as the main body of water followed, the chalk ridge eroded away. The valley behind it was flooded to form the Solent and the areas of sea we have today off Bournemouth and Highcliffe. At either end of the ridge, however, remnants of it remain. 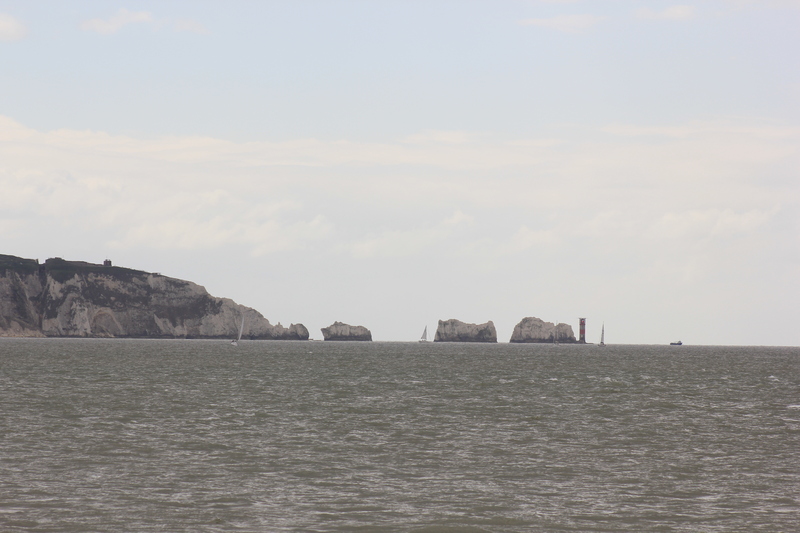 On the Isle of Wight, 15 miles away, these remnants are known as The Needles. I remember seeing them some eight months before as we walked along Hurst Spit. At the Studland end of the ridge it is the Old Harry Rocks which act as a reminder of what was here so many thousands of years ago. 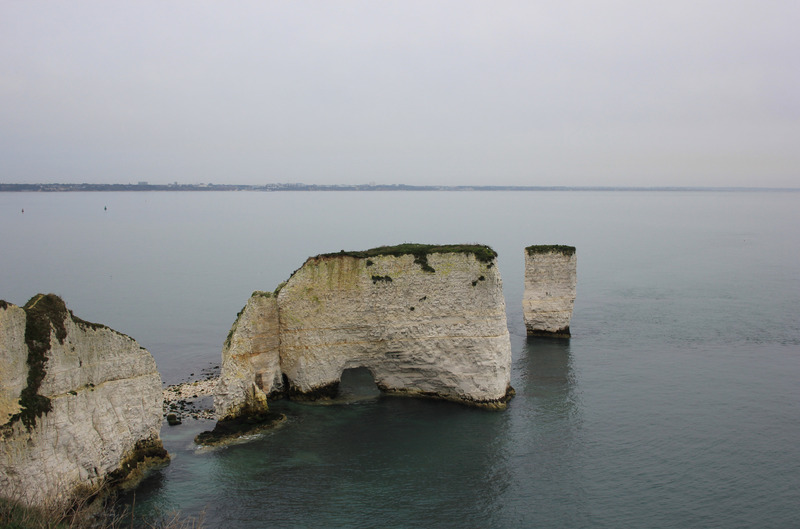 Old Harry himself is a geological feature known as a stack, and you can just see him peeping out at the back of this picture. The larger rock in front of Old Harry has a small sea arch at its bottom. This was once a cave, until the chalk was eroded away and the water broke through to form a natural arch. Over many years the chalk will continue to erode, widening the arch out until eventually its roof will collapse, leaving another stack rising out of the sea – a brother for Old Harry! Old Harry also has a wife. You can’t see her in the photo – she is hidden behind the large rock with the arch. 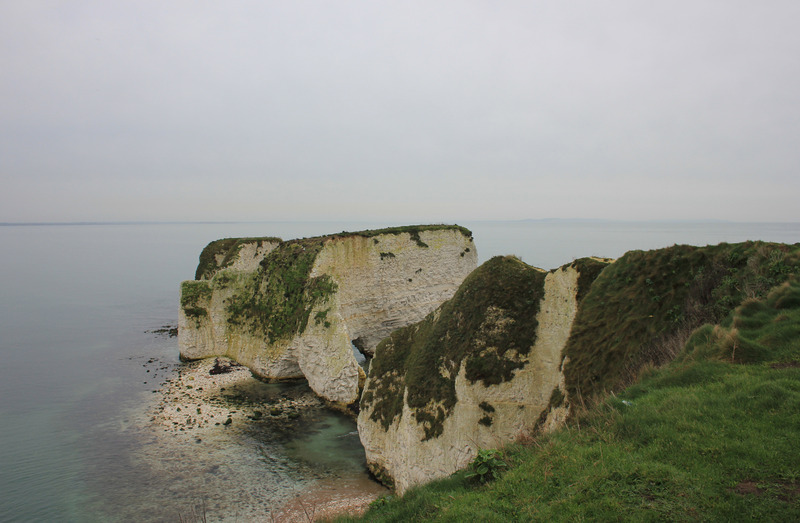 Old Harry’s Wife used to be a stack too, but the sea continued to attack her base, eroding it away. Eventually she collapsed, ceasing to be a stack and becoming instead a geological feature known as a stump. You can see Old Harry’s base is a little thinner than the rest of him. He is also being slowly worn away by the sea. One day he will also become a stump. If you want to get as close to Old Harry Rocks as possible then you must either sail out, walk round to them at a low spring tide, or take a massive risk by edging your way along the cliffs at Handfast Point to get as close as you can. Please don’t try this latter option, although from the worn nature of the track it is clear that many people do. I remember, many many years ago, taking a risk here. I scared my wife (then my girlfriend) and my mother half to death. I considered myself something of a mountain goat in those days and I remember feeling quite safe on the path (as you do when you are young and invincible). All the same, the alarmed cries from Deb and my mum drew stares from other people and the embarrassment caused me to abandon my precarious perch and come back to more solid ground (all young and invincible people respond very well to being embarrassed). And so many years later here I was, looking at the way along the clifftop towards Old Harry Rocks. This time I thought better of it. I’m not as young and invincible as I once was. Nor is the path by the look of it. 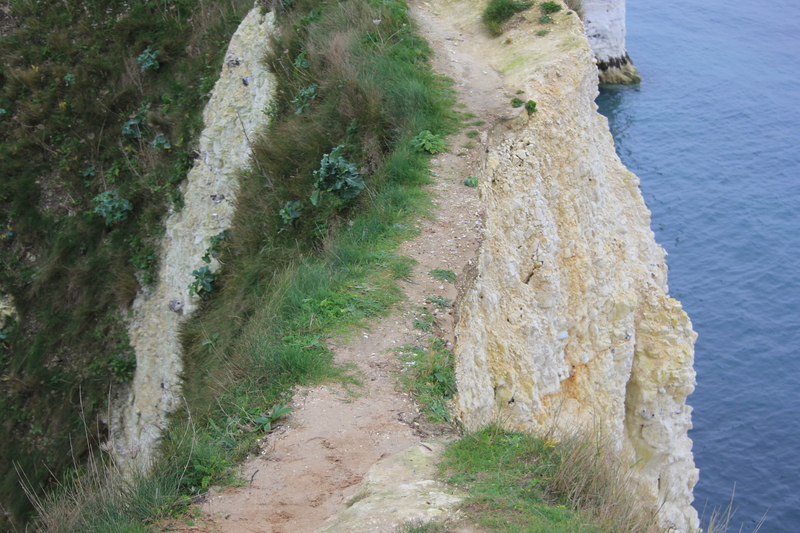 Two months and one day after we were here a woman slipped and fell to her death at Old Harry Rocks. Whether it was on this part of the path I do not know, but she has not been the first to lose her footing and her life here. 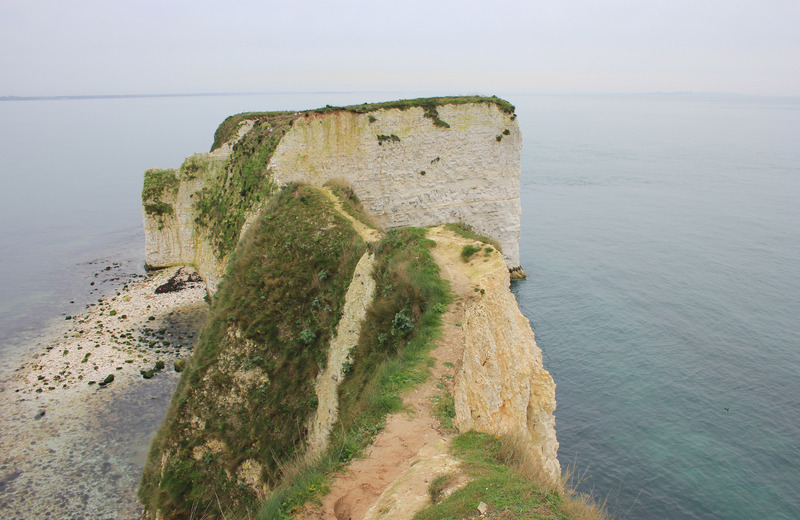 This entry was posted in Dorset and tagged chalk, coast, Dorset, geology, Old Harry Rocks, sea arch, stack, Studland, travel, walking. Bookmark the permalink.